Directional control valves in pneumatic systems serve a very specific function. The control valves are designed to stop, start, and even change the direction of flow within a compressed air application. In order to understand how pneumatic valves work, it is important to have a better understanding of the different types of valves available on the market. 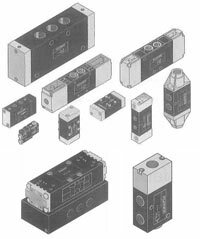 We can help you make pneumatic valve decisions. Despite your level of knowledge in the field, our talented team of engineers can help custom create systems that optimally work for your company’s specific and complex needs. Bonded spool valves employee elastomers as a means to seal against pressure. Almost no leakage happens with this tool. It can also be used in three-position applications. Spool valves can withstand dirt and varnish from compressors. If they are lubricated adequately, they could potentially run for millions of cycles. Spools come in both 3-way and 4-way configurations. Poppet valves utilize big poppet seals to operate in a way that is similar to a home faucet. The seal in the valve will move perpendicular to the valve, and so it will then push against the annular ridge (creating positive sealing). Valves, regardless of type, are built as a 2-way, 3-way, or 4-way construction. Knowing the specifics between types is our job. Give us a call to discuss your project with our engineers. We know pneumatic valves and pneumatic times.